Seventeen-year-old Jemma's older brother took her in when she needed to get away from her abusive ex-boyfriend, Razor. All Jemma wants now is to be a good mom to her baby daughter, Violet. But one night she needs to go out, just for a few minutes, to get diapers and ice cream. On her way back, she witnesses the drive-by shooting of a kid, Kwame, who lives in the same building. The driver is Razor. Jemma is terrified. If she tells anyone what she saw, they'll know she left her baby alone and she might lose custody. But if she doesn't, Kwame's killer will go free. Razor convinces Jemma to make a deal to save her life, but Jemma isn't sure she can live with the consequences. 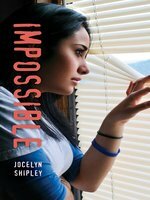 Jocelyn Shipley's YA books include How to Tend a Grave, Getting a Life and Seraphina's Circle, and she is co-editor of Cleavage: Breakaway Fiction for Real Girls. Her award-winning stories have been published in newspapers and anthologies, and her work has been translated into many languages for Stabenfeldt's GIRL:IT book clubs. Born and raised in London, Ontario, Jocelyn now lives in Toronto, Ontario, and on Vancouver Island, British Columbia. For more information, visit www.jocelynshipley.com. Follow her on Twitter @sageshipley.